My twenty-fourth ground of 2016 was on Saturday 26th November at Hill Park in Saltdean, East Sussex. 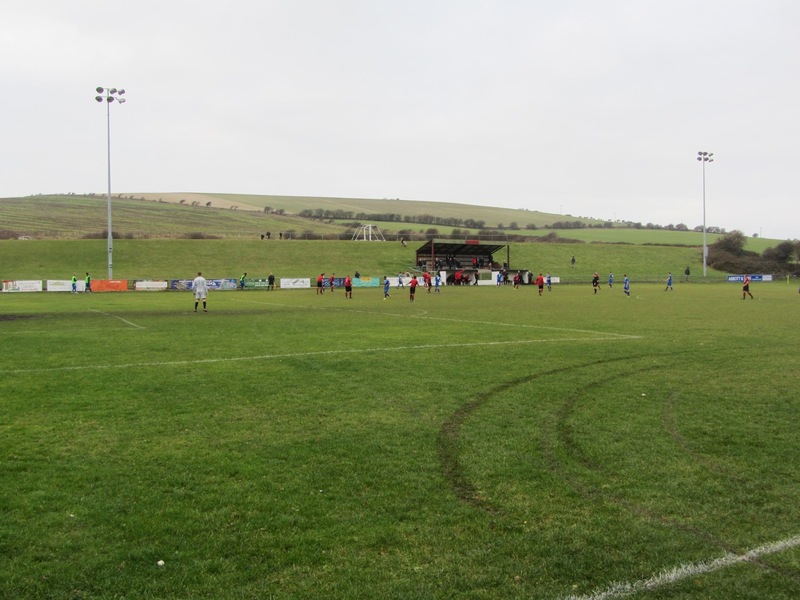 The match was Saltdean United vs. East Preston in the Southern Combination League Division One. Hill Park is on the northern tip of the village so is surrounded by fields except for a single house to the north and a caravan site to the south. 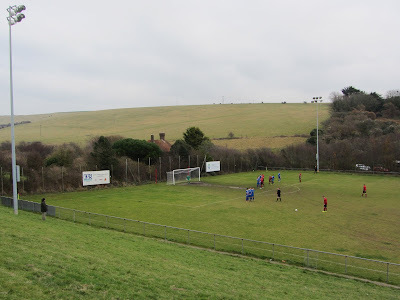 The nearest railway station is Brighton which is six miles west of the ground. The venue has been home to the club since they were formed in 1966. Outside of the confines of the pitch the eastern side of the ground has a smart club bar with an additional club building containing the dressing rooms. In front of this into the ground itself the eastern side is hemmed in by trees so there is just room for a single strip of concrete for uncovered standing. The west side of the ground has uncovered standing by the pitch and behind this a large steep grass bank which has an extra football pitch at the top of this. Built into the grass bank is the only stand which is a concrete structure which has several rows of benches to sit on. The area behind the southern goal starts off with a narrow area of standing but expands the further west you go leaving a grass area in the corner. There is scaffolding directly behind the goal which holds up netting to prevent balls going into the caravan park. The north of the ground is confined by the neighbouring house and trees so this is inaccessible to fans. There is fencing to mark the boundary of the ground but no space for supporters to go. The opening half-hour was a dull affair with the most interesting moment coming when play was stopped after a dog ran on the pitch. 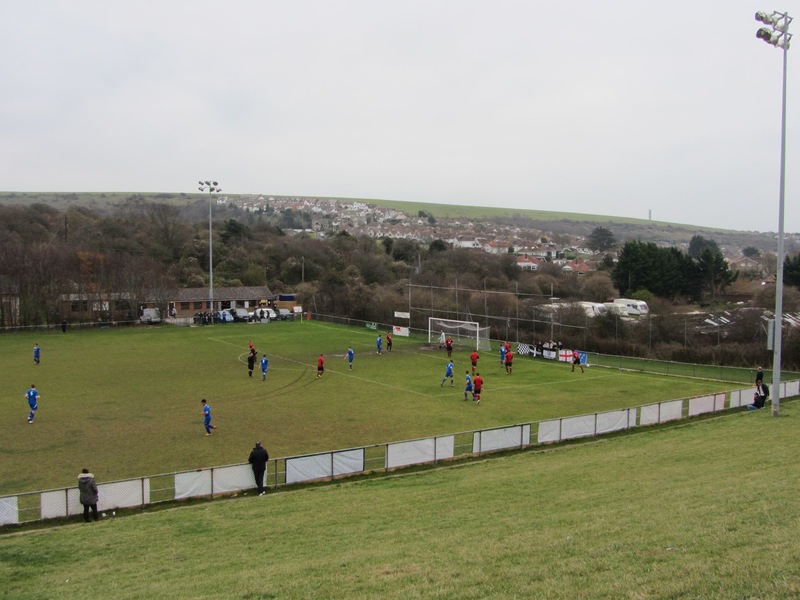 East Preston were on top though and on the half-hour mark Jared Rance beat his man down the left, crossed the ball into the box and a Saltdean defender's clearance hit the outside of his own post. The second 45 minute saw the pendulum swing back to Saltdean as they dominated. The closest they came was in the 65th minute when a cross from the left wing found Wes Millis who headed onto the post from 6 yards out. 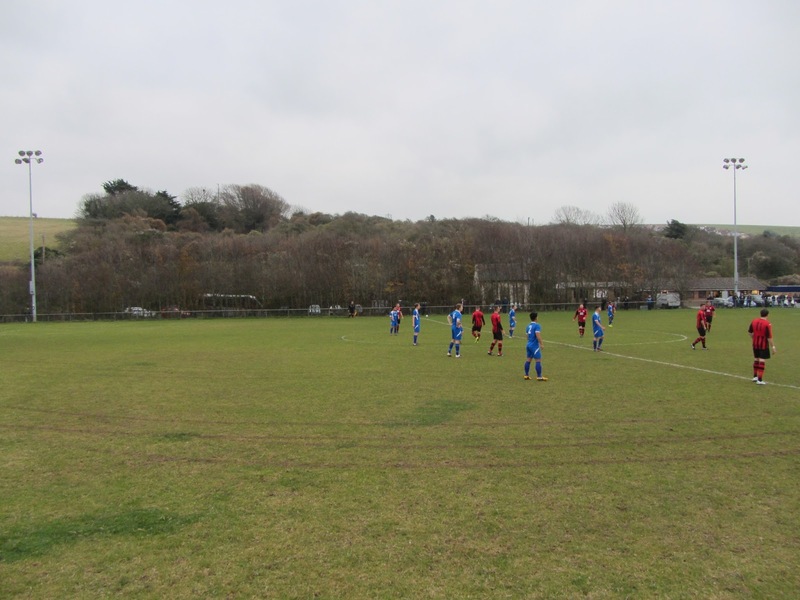 The hosts had a large number of corners which prompted several penalty area scrambles but each time East Preston were able to clear the ball away. The visitors only had one decent chance a few minute from time when Dan Huet slipped in Jared Rance but Rance's shot was saved and the match ended goalless.